Learn more about a new requirement under Title IX, Part A of the Every Student Succeeds Act (ESSA) for school counselors to assist homeless youth with college readiness and preparation. Hear specific strategies school counselors can use to encourage a college-going mindset among homeless youth and help these youth cover college application expenses. Download accompanying handouts. Christina Dukes is the federal liaison for the National Center for Homeless Education (NCHE). She represents NCHE and the federal Education for Homeless Children and Youth Program in federal policy discussions about preventing and ending youth and family homelessness. Heather Denny is the State Coordinator for Homeless Education and the Title I Family and Community Engagement Coordinator for the Montana Office of Public Instruction. Denny is a certified teacher and school counselor who has worked as a teacher and a district homeless liaison in schools in Texas, Florida, and Montana. 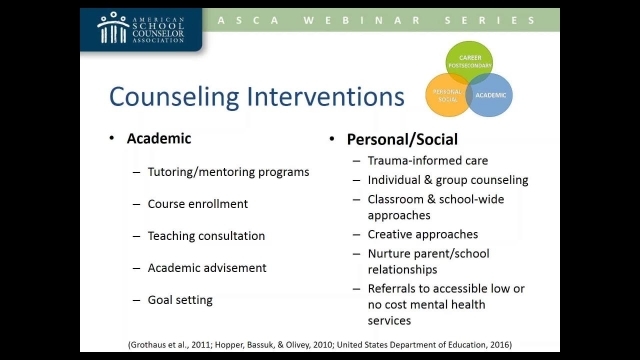 Stacey Havlik, Ph.D. is an assistant professor of counseling at Villanova University. As a former school counselor, Havlik’s primary research interests include investigating school counselor preparation and the issues faced by children and youth experiencing homelessness and those who are at-risk and facing challenges in their personal, career, and academic development.